Read more paper clay articles, find the leaders, suppliers and read discussions and debate on paper clay. Graham Hay explains how paperclay fits within the ceramic orthodox . THIS ARTICLE AROSE FROM DISCUSSIONS at the First International Paperclay Symposium at the International ceramic Studio, Kecskemet, Hungary in 2004. After more than a decade of use as a ceramic studio medium, paperclay is due for a reassessment. Given the persistent and increasing widespread use of paperclay around the world, it is useful to reconsider the place of paperclay within worldwide ceramic practises and traditions. The First International Paperclay Symposium provided a perfect starting point for this re-assessment. It brought together a geographically and artistically diverse mix of the experienced and inexperienced both with paper- clay and clay. It included studio potters, ceramic sculptors, educators, recent graduates, ceramic and industrial designers. The diverse experiences, techniques and styles between the 19 artists from 12 countries, created fascinating demonstrations, discussions and wide ranging debate. The mixing of straw (unprocessed cellulose fibre) into clay to reinforce it goes back, at least, to Pre-Christian Egypt (Exodus Ch. 5) and a papier-mache clay was used in Pre-history India. (Gault 1998). Pre-Colombian potters added cattail fuzz to their clays for various reasons (Rhodes 1973) and in the 1960s: industrial use of paperclays occurred (Schuster 1962). According to Rhodes many potters had unsuccessfully experimented with adding paper to clay. The key to the contemporary success with paper in clay is the removing of water repellent lignin (part of the industrial paper manufacturing process) and mechanically separating individual cellulose fibres before or during their addition to clay. The latter process results in a uniform dispersion of the fibre through the clay body, increasing the tensile strength of dry clay and maintaining tensile strength after firing. Inspired by industrial research by Schuster and others, Jaromir Kusnik made, exhibited and taught Western Australian potters how to make paperclay in 1989 as an inexpensive kiln shelf protector and to reducing warping in a hot and dry climate. (Hay 1996). In Banff, Canada, Englishman Ibrahim Wagh's talk on his fired paperclay "paintings" inspired Rosette Gault, (along with Canadians Alex Sorotschynski, Jennifer Clark and Denise Buckley) to undertake successful research there in 1990, and in 1991 (with the addition of New Zealander Brian Gartside). (Gault 1992, 1993). Articles on paperclay in international ceramic journals by Gault and Gartside, did much to ignite international interest and the sharing of information between ceramic artists around the world. Paperclay is often defined as any clay to which paper fibre has been added. This definition is too narrow because paper made from wood pulp or cotton is not the only source of processed cellulose fibre used by artists and manufacturers to make paperclay. Processed flax, and other plants can be used, and the food industry is also a source of processed cellulose fibre. Due to a number of constraints, paperclay made from paper (toilet paper) was predominately used (and made) at the symposium. As implied above, the support of writers, editors and publishers played a critical role in initially raising awareness of paperclay. But written information can become redundant, unless the ideas are taken-up and perpetuated by private and public organisations. These organisations not only legitimise ideas and practises, they also train new practitioners and foster further research. 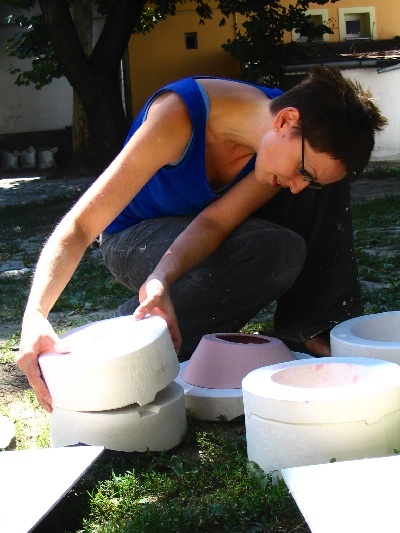 The hosting of the first international symposium at the International Ceramic Studio (ICS) in Kecskemet, Hungary, is indicative of a growing awareness of the use of paperclay and its practitioners by international institutions. It is hoped that the ICS and similar international institutions will continue to train new paperclay practitioners and foster further research via their programs. Since then there has been an explosion in the amount of paperclay information available. More than 40 journal articles on paperclay have been published in ceramic journals, including Ceramic Technical and Ceramics Art and Perception. Books by Rosette Gault in the USA (1993) and Anne Lightwood in the UK (2000) provided an overview and structure to the emerging body of knowledge, plus recorded the diverse methods and imagery used. Most new and revised ceramic textbooks now include sections on paperclay. The detail provided is still uneven, but rapidly improving. Similarly there is no shortage of information and discussion about paperclay on the Internet. Clayart, Yahoo and Bravenet have either included discussions on paperclay or have specialised paperclay discussion groups. The number of practitioners using paperclay either selectively or exclusively has now been steadily increasing for more than a decade. An interest in a "new" material and its ready availability does not fully explain this continued increased use. Educational institutions have an important role in introducing new practitioners and audiences to the medium, and so increasing demand. 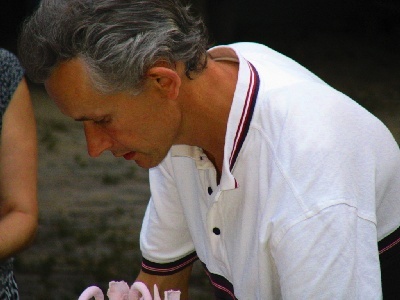 Many educators pass on information on and demonstrate paperclay making and techniques. In Australia and elsewhere, it is taught to primary, secondary, tertiary (including student teachers) and recreational level students. When it is not taught at post-secondary level, students have independently sought private paperclay instruction from others and myself. In some regions between a third and a half of clay sold to schools is paperclay (personal comm. Australian art suppliers). And for good reasons too: Mechanical recycled of clay either by hand or pug mill is no longer necessary (just drop firm or dry paperclay into water to soften). Small air bubbles in the clay body can be ignored (the fibre acts as vents), repairs/alterations to dry work can be made and final works does not always need to be fired. Works can be left to dry, and resumed weeks later after soaked in water. While paperclay techniques are taught at university with traditional ceramic techniques, occasionally a semester unit is dedicated solely to paperclay, such as the unit I designed and taught at Edith Cowan University, Perth in 1999. Based upon ongoing correspondence from postgraduate students, it appears that paperclay is now firmly entrenched within the international postgraduate university community. While the rate of the spreading of paperclay within each country is uneven, an annual doubling of sales of manufactured paperclay is not uncommon, admittedly from a low base (informal symposium discussions). Perhaps the next most important indication of the acceptance of paperclay as a legitimate art or craft material is its acceptance by the buying public, critics and its inclusion in major public and private collections. My experience is that for most of the public, the material in which the work is made is immaterial; apart from making sure it is weather or dishwasher/microwave proof. Some artists sidestep any concern by removing any mention of paperclay and simply describe the work as "ceramic". This avoids any confusion with papier-mache and other modelling materials. Curators and collectors seem similarly unconcerned, provided the work bears some resemblance to contemporary or traditional ceramic works. framework to examine paperclay works. My experience is that critics are heavily influenced by the level of their knowledge of ceramics, the information provided by the artist, and the nature of the publication they write for. The material history of paperclay is assumed to be purely ceramic. This because it has been used initially by, and spread quickly with, the ceramic arts and ceramic craft communities. Discussions at the symposium included an attempt to differentiate how paperclay is different from the past ceramic craft and ceramic art traditions. I saw it as an attempt to create a theoretical framework for paperclay. Any such narrow discussion is problematic, as it ignores the history and material cultural of paper, and also fibre. So the title of the First International Paperclay Symposium; Paperclay firing fibres is particularly appropriate, because that it acknowledges this fibre, not just paper connection. Similarly, at the Hungarian Symposium Rosette Gault cast paper-thin slabs, dried before wrapping them to build delicate figures and vessels. 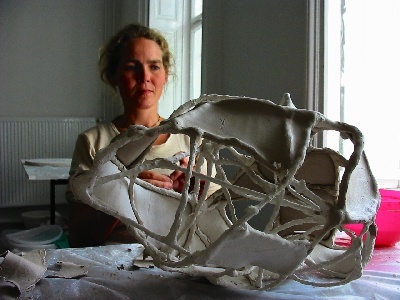 Tina Neale built human forms with paper- thin sheets of paperclay and used a slip trailer to create delicate drawings on newspaper. Malene Pedersen flattened soft paper- clay into paper thin sheets before joining these together over branches. Laszlo Horvath, Julia Nema and to a lesser extent Kornelia Janisch cast paper-thin translucent sheets and forms. Gabriella Kuzsel created delicate relief text from newspaper. Others, such as Margit Gerle, Astrid Heimer, Kornelia Janisch, Julia Nema, Anjani Khanna, Gabriella Kuzsel, Jiri Lonsky, Malene Pedersen, Maria Gelabert Tana, Sandra Torres and myself repeatedly applied layers of paperclay slip over forms made from foam rubber and other materials. Margit Gerle used a stoneware slip mixed with flax fibre. Much of the uniqueness and delicacy of these paperclay works and techniques can be fully explained by paper's material properties: its dry material strength and water-absorbing capabilities. I believe this reemphasis on the properties of, and cultural influence of, paper and fibre in paperclay, addresses the concerns expressed by the symposium participants. One of the recurrent themes at the symposium was the increased artistic freedom offered by paperclay, compared to conventional clay. However, I am not convinced that paper- clay automatically does this for everyone. 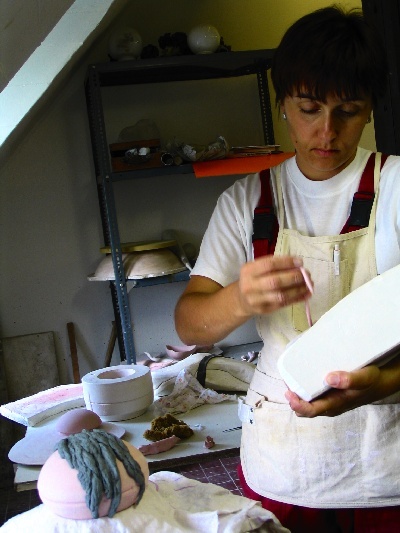 Established ceramic artists may not be interested in changing the clay they use. Thinner walls, dry-to-dry joins, slip-to-dry and accelerated drying were often mentioned at the symposium as significant improvements offered by paperclay, compared to conventional clay. These are certainly clay, labour and time-saving advantages. But these advantages are not always the central concern of established artists who are known for a particular style of work, which is a product of their particular way of working with conventional clay. My experience in Perth, Western Australia, has been that the spread of information on how to make and use paperclay did not immediately cause a big increase in its use. This was because making it by hand is a long, labour intensive and messy process. However, once commercially made paperclay was readily available in art supply shops, the interest in and use of paperclay dramatically increased. It will be interesting to see if the Australia and American experiences are duplicated in other countries as clay manufacturers begin to convert their conventional clays into paperclay. Individual clay manufacturers have been reluctant to take a commercial risk in being the first to convert their clays into paperclay. In Western Australia, Clay Cottage (later bought by Cook Industrial Minerals) was the first Australian paperclay manufacturer. (Ed: A year later Blackwattle Pottery was the the first in New South Wales, followed by Keane Ceramics a few years later.) Often it is the smaller, more adaptive firms who moved quickest, gaining a profit and market share advantage by doing so. In the USA commercial manufacturing and sales of paperclay followed in a similar pattern, but in a more uniformed form under the supervision of the USA patent holder Rosette Gault. In licensing selected clay manufacturers Gault has sought to ensure consistency of quality and supply. Quality has sometimes been uneven in Australia, as each manufacturer has independently learnt from trial and error how to convert their clays into this new material. Similarly, disagreements between manufacturers and retail chains have occasionally disrupted supply. In Thailand the two clay manufacturers have not started adding fibre to their clays, however a fibre processor was seriously considering manufacture a dry paperclay. Increases in the range of paperclays provided by the different manufacturers cater for individual artistic preferences. Commercially made sculpting and throwing bodies P'ClaysTM appeared in the USA from 1995 onwards. Also in 1995 Western Australian firm Clay Cottage begun converting its earthenware and stoneware clays into paperclay after receiving advise from Ceramic Chemist Jaromir Kusnik. Scarva produced smooth, grogged, white earthenware, porcelain and terracotta FLAXpaperCLAY in Ireland from 2002. The unusual Keraflex paperclay (actually a ceramic foil and tape) is made in German by Kerafol. A similar paperclay paper is currently under development in Thailand by the National Metal and Minerals Technology Centre (Mtec). Countries with smaller studio ceramic communities, such as Singapore and some Scandinavian countries, already import paperclay from other countries. Gault, R. (1998). Paper Clay, A & C Black, London and U. of Pennsylvania Press, p.11. Rhodes, D. (1973) Clay and Glazes for the Potter, A & C Black, London (2nd Ed) p. 57. Schuster, H.K., (1962) 'New specialised papers for the entire field of bricks and earths', Intercerm Journal, 2, pp. 102-104. Anne Lightwood (2000) Paperclay and other clay additives, Crowood Press, UK p.73. (Hay (1996) With but not on Paper, a history of paperclay in WA. Pyre: CGA (WA) Journal. (W.Australia), 9, p.4-5. Gault, R., (1993) Second Generation Ceramics: Technical and aesthetic potential of paper- clay, Interaction in Ceramics, UIAH: Helsinki, p.79. Gault, R., (1992) "Amazing Paperclay", Ceramic Monthly, June/July/August p.96). Hughes, S. (1978) Washi The World of Japanese Paper, Tokyo, Kodansha Interna tional. Similarly, the technical shortcuts offered by paperclay make technically difficult work easier to make. Large, thin and highly textured work can be easily made by the less skilled. But not every artist wants to make large, thin and highly textured work. Even highly motivated experienced artists may find it difficult to understand and use the new material. They have to put aside methods they were taught, and may have taught for many years. Decades of studio experience entrench these conventional ways of thinking about and using clay. Not all have the time or interest to change these studio rituals. This is not the case with new entrants to the profession. Given the inherent resistance of experienced artists to paper- clay, its rapid spread is even more surprising. What sorts of people are taking up paperclay? Discussions at the symposium suggests that paperclay attracts new entrants to ceramics, and those frustrated by the physical limitations of conventional clay. The former find it more forgiving of their errors in technique. Despite their lack of clay experience, paperclay offers a way to accelerate the expression of their ideas and emotions. For the latter, it allows them to more fully express themselves, while still using clay. For both, paperclay is liberating. However, new entrants to ceramics may only use paperclay to make traditional or conversional work. Similarly those frustrated by the physical limitations of conventional clay may simply use paperclay to reduce production time for their conventional work. In these cases we are unlikely to see new ideas expressed in ceramics by those using paperclay. Many symposium participants stressed the feeling of artistic freedom that paperclay gave them. This is because there is no established cannon of aesthetic values with the material. Both Rosette Gault and I stressed that paperclay techniques are still being developed, and that our ways are not the only ways of working with the material. Dry-to-dry, wet-to-dry, drywall, paperclay food, paperclay wool, paper- clay foam, emersions, unfired installations are just some techniques that were presented at the symposium. We see the real challenge for paperclay users, is to extend the range of ideas and emotions expressed in clay and fibre. Similarly, I hope that the increased versatility of paperclay will enable a better expression of themes traditionally explored in ceramics and fibre. Lastly, I hope that paperclay will enable work that is not physically possible to make in conventional clay or fibre. To discover how to make such work, may be a trial and error process. For these three things to occur, ceramic artists will need to take time to learn more about fibre, its processes, and aesthetics, and incorporate these with the ceramic tradition. Graham Hay is ceramic artist and teacher living in Western Australia. See www.grahamhay.com.au for a complete list and copies of the articles, links to experts and links to the key discussions on paperclay. The ICS has been providing a venue for the meeting of ceramic artists and sharing of ideas in a supportive environment for more than 28 years. Link to it's website, where there are hundreds of images, information and links from this symposium at www.grahamhay.com.au/icsinvite.html. This type of international institution support will promote paperclay to all countries, not just in Hungary and countries with established paperclay using communities. Guest artists at the symposium were Rosette Gault (USA) and Graham Hay (NZ/Australia). The participants were, in alphabetical order: Jerry Bennett (USA), Krittiya Chunhashevachlock (Thailand), Edit N. Csehi (Hungary), Margit Gerle (Hungary), Astrid Heimer (Norway), Laszlo Horvath (Hungary), Kornelia Janisch (Hungary), Julia Nema (Hungary), Anjani Khanna (India), Gabriella Kuzsel (Hungary), Elisabeth LeRetif (France), Jiri Lonsky (Czech Republic/USA), Malene Pedersen (Denmark), Pirjo Pesonen (Finland), Tina Neale (Wales), Maria Gelabert Tana (Spain), Sandra Torres (Mexico/USA). Find the experts, suppliers and read discussions and debate on paper clay. 2015 Journal article documenting the background to the event. ​Reproduced from Hay, G. (2006) A Paperclay Update, Ceramics Technical, 22, 37-40 with permission from Janet Mansfield (editor) to reproduce this article at www.grahamhay.com.au/hay2006update.html. More articles on paperclay here, and by the author here. ​Some modification of layout has been made to improve reading from a screen.